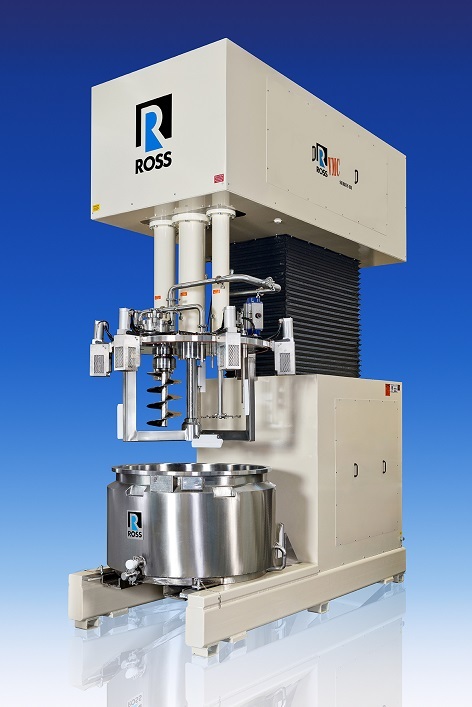 Ross recently designed a custom 150-gal triple shaft mixer with elaborate automation and safety functions (VersaMix Model VMC-150). Notable among the special added features are six pneumatic clamps rated for 4000 lb each for remote locking of the mix vessel to the mixer cover designed for 29.5 in. Hg vacuum and 5 psi internal pressure. The clamps also function as redundant limit switches, allowing for operation only when secured. The VMC-150 also includes automated valves for powder feed and CIP liquids, an RTD multi-point temperature sensor, a built-in vacuum pump assembly, a load cell system, and a centralized HMI. The three independently-driven agitators of the triple shaft mixers include a high-speed saw-tooth dispersing blade for quick product wet out, a three-wing anchor for efficient transport of viscous product throughout the mixing zone, as well as a third shaft, frequently a high-shear rotor/stator homogenizer for emulsification. The VMC-150 pictured instead features a helical auger screw for submerging floating agglomerates. When reversed, the auger screw surfaces air pockets resulting in decreased batch cycle time. The sides and bottom of the mixing vessel are jacketed and insulated for operation up to 100 psig at 250ºF.